The Moroccan design aesthetic can be seen in clothing, architecture, home furnishings and kitchen utensils, first adopted in European markets, and now in the United States. And now that you are going to Morocco, you'd like to bring some things home. 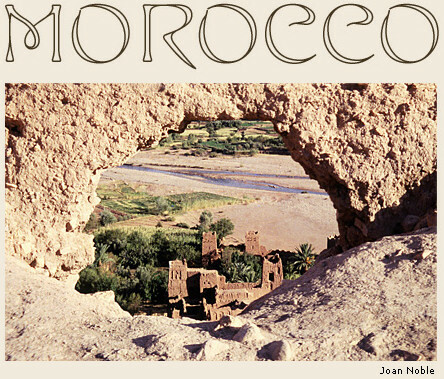 Go online, Google Arts and Crafts in Morocco, and look at Moroccan jewelry, clothing, artifacts, etc. to get a sense of what you'll be seeing. Check amazon.com to see what books are available on the subject; they may be available at your library, if you prefer not to purchase them. Great idea: make a photo copy of items you find of interest so you can show them to your guide and/or shop keeper in Morocco. It is strongly suggested to shop with a trusted guide, which your hotel can recommend. He, or she, can take you to shops based on your requests – and make other suggestions. Please note that wherever you are taken, the guide will earn a percentage of your puchase, given by the shop owner. This is part of the culture, do not be dismayed, surprised or angry. He or she understands that taking you to the right places, and helping you bargain, is also in their best interests. A guide will save you time and will know where to go. Visitors to this welcoming country may be overwhelmed by the number of stalls and shops in the medinas (old towns), and the modern stores found in the Ville Nouvelle, or new sections of towns and cities. Entering into the medinas, with their narrow streets filled with fountains, bakeries, mosques, cafes, barber shops, jewelry and brass and decorative items, temptations are everywhere. Similar items are often grouped together, which makes shopping easier, if one is looking for something particular. In the medinas, you may find many textile shops one after the other, along with ones selling trimmings, threads, buttons, etc. Caftans (a long robe worn by women), and djallabas (a long robe with a pointed hood, worn mostly by men), are sold in the same shops, these catering to the foreign visitor. Fabric, design, colors and quality to suit every budget may be found here. Cotton, silk, polyester, cashmere – something for everyone, including clothing for children, which make excellent gifts. In the Ville Nouvelle, upscale shops can be found catering to the local people, making garments to order, and often with the classic Moroccan slipper (babouche), to match. And the rugs! Morocco is so famous for it's handwoven textiles, woven mostly by women in the villages of the Atlas Mountains and the desert, as well as in many homes and coops along the excellent road system throughout the country. Men travel to these villages to purchase rugs – perhaps something from a dowry woven long ago and now for sale by a family in need of money – and bring them back to the city to sell in the rug shops which are everywhere, often in gorgeous renovated riads (former private homes or small palaces). Men, speaking several languages, will invite you into their shop to see their wares; if you are not interested, do not go in. "No" is difficult for the men to accept, sure you will succumb to their spirited presentations. But stick to your guns, smile politely and keep going. But, if you might be interested, do go in. You will be offered a seat along a wall facing the large expanse of the courtyard, offered almonds and the ubiquitous mint tea, and shown a large sampling of rugs – some excellent, authentic and hand woven, some of poor quality, perhaps machine-made. Your guide can help you learn the differences. If you do come to Morocco desiring to acquire one of the gorgeous rugs, bring color samples and sizes from home. Once you have seen the various styles, you should indicate what type you find attractive, indicate color and size. You will be tempted to ask the price of something, just to get an idea of where the prices begin, and they will assure you of the best price. Know that with hard bargaining on both sides, you can often buy a rug for at least half the starting price. They will make an offer, you will respond offering much less. And after more tea, more discussions, pleading, tales of desperation and need in a failing economy, if you stick to what you really want to pay, you will arrive at a price acceptable to you both. Americans are hesitant to bargain and do not like to do so; if that is the case, then just tell your salesperson what you want to spend and he will show you what he has at that price. But understand that you could do better! Your guide will assist you. No one will sell you anything if they are not making a profit. The key is to always be civil, friendly, never angry. This back-and-forth is the key to shopping everywhere in Morocco, part of the culture. And great stories come out of these encounters. Rugs can be rolled tight, wrapped in sturdy plastic and tied with a handle so you can take it on the plane home. Reputable shops can arrange shipping and insurance, if preferred. There are many shops selling beautiful Moroccan-style tables and chests, candle sticks, Judaica, mirrors and more, some obviously too large to carry home. Again, bargain hard for something you have fallen in love with, and they will ship and insure. The above tips on bargaining apply. The jewelry is unique – from delicate silver filagree to chunky, tribal styles, some with old coins, amber and decorative stones. There are a few good shops, selling authentic pieces, and then there are the ones selling copies, vendors in the streets offering "real" tribal pieces for a pittance – which are not real and may fall apart before you get home. The latter are OK for little gifts, but understand they are not quality pieces. Again, bargain for the good pieces. Inside the medinas you will also see spice shops, selling cumin, turmeric, dried oregano, musk, rose cream and many other items for cooking and cosmetics. It is great fun to go into a "Berber pharmacy" and sit through a presentation of all these items. They make excellent gifts and are lovely reminders of your trip. The spices are sold in small packets, easy to pack. Argan oil is the hottest item in the beauty market all over the world. Morocco has the argan trees which produce the nuts to make this oil, and the products are well priced: oil for massage, oil for salads and cooking, face and body creams and much more. Great gifts. Leather in Fes is famous – a trip to the tanneries is not to be missed! You'll see men up to their waists in vats of colored dyes, dipping sheep, cow and goat skins to obtain the desired colors. There is always a shop attached to the tannery, where you go up to the rooftop to take photos of the unique display below; one can of course bargain for the jackets, bags, hassocks,belts and slippers, all in many colors. Fes is also noted for their beautiful pottery. A trip to one of the workshops just outside of town is worth the experience to see how it is made, fired and painted. Olive pits are used to feed the intense fires needed to produce the good quality pottery. Purchases can be made, and shipped if desired. Complete dinner sets, single pieces, pitchers, tiles and more are available. Prices here are fixed. I hope these tips are helpful – remember to have fun with it! Noble Journeys has been arranging tours for individuals and small groups since 1995 and would be pleased to assist you.